One of the things I like most about Michelle being my craft buddy is that she demands progress updates, especially the projects with a deadline. She is the reason why I managed to get all those stockings finished in time for advent two years ago. The thought of reporting that I was behind schedule was enough to kick me up a gear. I got a text today asking how the pikachus were going and I was able to report that one was stuffed and has ears and the other is waiting to be stuffed and needs ears. All that they need is arms, legs, a tail each and then facial features. I think I have about two hours of knitting time left and then I shall whip out the felt and my glue gun and proceed to burn off my fingertips* as I attempt to give them faces. * this will most certainly involve swearing. Most excellent! I'm impressed, I think you could easily have added a couple of tea cosies, or a headband and a cowl to your christmas knitting list too ;) You're going to have time to spare! I'm rather disappointed in myself however, no last minute christmas crochet list, and three projects I should have blogged by now. 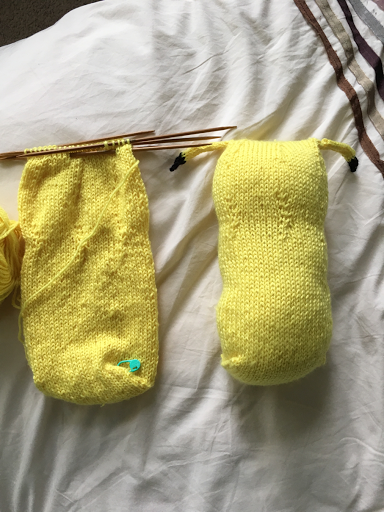 Tell me, with projects like pikachu, do you just have the yarn lying around or did you need to buy it? What sort of yarn did you use? All my secrets laid bare.... I have a draw of crap Acrylic in my lounge room. IIt was purchased when It was on sale a few years ago and is intended for toys, decorations or sending to friends when they are a few pompoms short of a wreath. It's a magic drawer that hasn't let me down so far! Looking good! Be careful with that hot glue gun, those things are fiendish. I also forgot to mention that I have to find the evil thing first too...it's at the back of a cupboard, I hope I have spare glue sticks or I will be writing about the versatility of super glue!